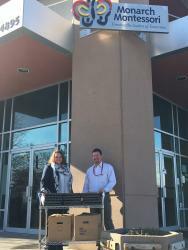 Michael McCurdy, a member of Bridgepoint Education's BTS team, delivers the company's laptops and computer equipment donation to Tammi Mobley, first steps director at Monarch Montessori of Denver. Bridgepoint Education, Inc. (NYSE: BPI) provided laptops and computer technology equipment to Monarch Montessori of Denver. Representatives from Bridgepoint presented the donation to the school on December 12. The company’s donation will help to provide a quality educational experience for students and families who live within the Montbello, Green Valley Ranch, and Stapleton areas of Northeast Denver. To learn more about Monarch Montessori of Denver, visit www.monarchm.com/.